Daled Amos: Is There A Pattern of New York Times Bias Against Israel? Is There A Pattern of New York Times Bias Against Israel? 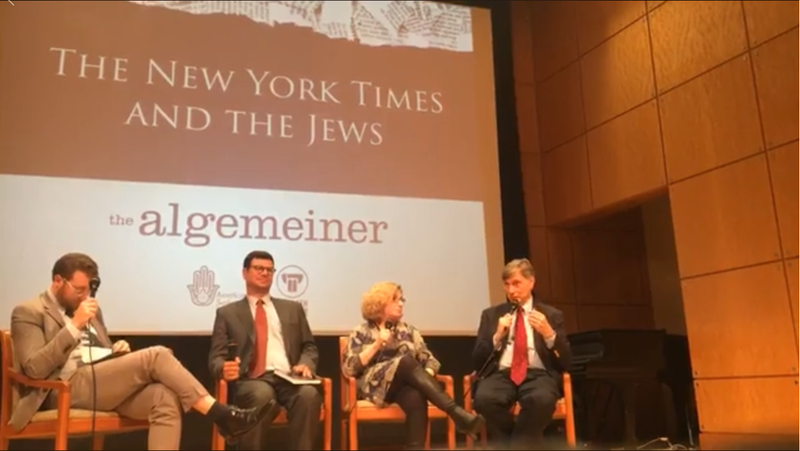 Last week, The Algemeiner held a discussion about The New York Times and its coverage of both Israel and of Jews in general. Entitled, "The New York Times and the Jews," it was hosted by Dovid Efune, the Editor-in-Chief of the Algemeiner and featured Ira Stoll, Laurel Leff and Dovid Goldman. Ira Stoll writes a regular column for the Algemeiner, where he critiques the New York Times coverage of both Israel and of Jews. Laurel Leff is the author of Buried by the Times: The Holocaust and America's Most Important Newspaper. Ari Goldman was a journalist with the New York Times for 20 years, from the 1970's to the 1990's and now teaches journalism at Columbia University. Dovid Efune, Ira Stoll, Laurel Leff and Ari Goldman discuss "The New York Times and the Jews"
The crowd that came to hear the discussion was one of the largest for one of Algemeiner's events. Many may have come to see and hear The New York Times burned in effigy. Instead, the presentation was even-handed, despite the fact that the paper had turned down an opportunity to have someone attend to represent them. During her part in the discussion, Leff presented some historical background of the New York Times and differentiated between the philosophy of the paper early on, in contrast to what it is today. 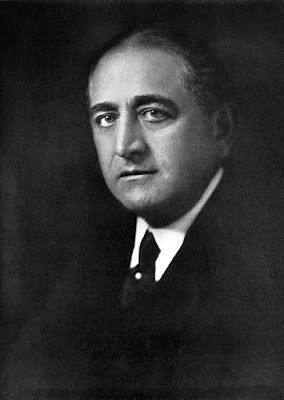 The founder of the modern New York Times was Adolph Ochs, who bought the paper in 1896. His parents were German Jews who came to the US in the 1840's. Ochs married Iphigene (Effie) Wise, the only child of Rabbi Isaac Meyer Wise, the founder of Reform Judaism and its institutions in the US. This is important because Ochs adopted his father-in-law’s philosophy, as did his own son-in-law, Arthur Hays Sulzberger (publisher 1935-1961), later. Sulzberger, a Reform Jew, was an outspoken anti-Zionist at a time when the Reform movement was still debating the issue. A basic idea of Reform Judaism was that Jews were no longer a people, an ethnicity or a nation. Judaism was just a religion. The paper opposed to the creation of a Jewish state in Palestine, a big issue during the war. But despite this negative view of Israel, that attitude is not necessarily relevant to the New York Times coverage of Israel and Jews today. While classic Reform Judaism had a tremendous impact during the first half of the 20th century, the attitudes it fostered at The New York Times basically died with Arthur Hays Sulzberger, who remained an unrepentant, anti-Zionist, classical, Reform Jew. Most Reform Jews abandoned that anti-Zionist position and supported the creation of the state of Israel. As a result of this change, Sulzberger became disillusioned with Judaism and withdrew. His attitude towards Israel was not passed on to his son, the second Arthur Sulzberger, who became indifferent to his Judaism and married an Episcopalian. According to Leff, the current publisher, Arthur Gregg Sulzberger, has no connection to Israel or Judaism and there is no sense of Jewish identity left. This does not mean there are no biases or that their coverage cannot be criticized. It just means that the basis for the paper's view of Israel does not come from any historical sense of their Jewishness. Bottom line, the current publisher does not care especially about Judaism and is not like the first Sulzberger, who was strongly motivated by his anti-Zionism. Ira Stoll addressed what Dovid Efune playfully suggested were “the most egregious crimes” of The Times. Stoll noted that for something to be a crime, one needs to prove intent. Instead, he said, these issues were mistakes, errors, problems -- and bias, only if one can see patterns. And before dealing with the “why” and the motivation, it is safer to start with the mistakes and what categorizes them. Towards that end, Stoll offered a categorization of some of these problems in the paper's reporting, based on his book, a collection of his critiques of The New York Times appearing in his Algemeiner column. The book is entitled "The New York Times and The Jews". An earlier version of this article incorrectly implied that beef tenderloin is kosher and appropriate for Passover. It is not kosher, but other cuts of beef that are kosher may be used in the recipe in its place. "The US House of Representatives voted on January 5 to approve a resolution objecting to UN Security Council Resolution 2334 as “biased against Israel” and calling for it to be repealed or fundamentally altered." "An attempt by the Hamas terrorist group to use cancer patients to sneak explosives into Israel"
"The Palestinian president publicly called the American ambassador to Israel, Dovid Friedman, a “son of a dog” — and The New York Times ignored it." None of those stories made their way into The New York Times. Stoll mentioned the inconsistent use of adjectives in describing world leaders. He pointed out that The New York Times has described Israeli Prime Minister Netanyahu as both loquacious and taciturn, as he also describes online in Does Bibi Talk Too Much, or Too Little? The New York Times Has All The Answers. Stoll referred also to the different ways Iranian Foreign Minister Zarif and Netanyahu are described, a point he elaborates on in New York Times Showers Compliments on Iranian Foreign Minister. Zarif is referred to as “the urbane, American-educated diplomat,” while Netanyahu is not referred to being American educated at all. In the same article, Stoll points out that Defense Minister Lieberman is described as "ultra-nationalist" and John Bolton, before becoming National Security Advisor, was described as "combative." Here too, Stoll described the category without actually giving any examples. New York Times Coverage of Jews, Israel, Is as Slanted as Its Coverage of Trump contrasts the superior coverage of a Muslim art exhibit in Washington, DC as opposed to an exhibit of First Jewish Americans in New York. Besides the difference in location of the article in the paper and the size of the article, the article about the Jewish exhibit concludes “in the exhibit, we see the kind of religious fervor that promotes a kind of violence against certain groups” -- and odd, negative mention that does not appear in the other article about the Muslim exhibit. By contrast, when Israeli author, Daniel Gordis, came out with his book 'Israel: A Concise History of a Nation Reborn,' there was no interview, no review and no coverage. Another category of problems with The New York Times is its use of anonymous sources. Despite its stated rule not to overly rely on them, there are cases where the paper does not adhere to its own standard when it comes to Israel. In his article In Its Attack on Netanyahu, the New York Times Violates Its Own Anonymous Source Policy and Contradicts Itself, Stoll notes how the paper patted itself on the back on its campaign to cut down on the use of anonymous sources -- and how they seem less successful in this goal when it comes to Israel. Stoll could have made a far stronger case for a pattern of bias in The New York Times if he had given examples for each of the categories he mentioned. Ari Goldman, as a former journalist for The New York Times, takes up its defense. Goldman stressed that The New York Times is run by human beings who make mistakes every day. And correct them. This is what it means when journalism is referred to as "The First Rough Draft of History"
Since journalists can only go by what they know, errors are not necessarily a conspiracy. It could simply be the information they have available. He conceded that The New York Times has an agenda It is an agenda to write "great" stories in the "most dramatic, exciting" way. Left unaddressed was the question whether the desire to write great, dramatic and exciting stories might potentially lead a journalist to allow their biases to dictate the story or to exaggerate or omit information. Goldman also tried to make the case that The New York Times was not a liberal newspaper. His proof was that the paper exposed the Eliot Spitzer scandal and covered the story of Hillary Clinton's email server. By that standard, if Fox News reports scandals of conservative politicians, should that serve as proof that they are not a conservative news program? Goldman claimed that Jews and Israel were just not as high on the agenda of the paper as it was during his time there in the 1970's through the 1990's, saying "I don't think they care as much about us as we care about them." But even Ari Goldman agrees there was a real problem with The New York Times coverage of The Crown Height Riots in 1991, the 3 days of riots following the accidental death of Gavin Cato by one of the cars in the Lubavitcher Rebbe's motorcade. Three hours after the riot started, a mob surrounded Australian Jew Yankel Rosenbaum and murdered him. Ari Goldman was one of the journalists who covered the story for The New York Times and in 2011 wrote an article for The Jewish Week -- Telling It Like It Wasn't. Goldman quoted himself from that article, that during those riots he saw "journalism go terribly wrong" in framing the story as a clash between the black community and the Jewish community instead of recognizing the issue of black Antisemitism. According to Goldman, this perception of a "clash" was even picked up by the Jewish community itself at the time. He said that the JDL admitted that it did not come out as strongly for the Lubavitch community at the time as it should have because of the way the riots were framed. None of the speakers seemed to sense any comparison between the media coverage of The Crown Heights Riots and the Israeli-Palestinian Conflict. Both the riots and the conflict are described by the media as clashes of equally responsible groups, without any sense of the Antisemitism involved. How often have we heard of the conflict being described as a "cycle's of violence" where both sides are warned to show restraint. Goldman writes that in order to show Jewish culpability during the riots, The New York Times went so far as to run a picture of a Chasidic man "brandishing an open umbrella before a police officer in riot gear" with the caption "a police officer scuffling with a Hasidic man." In the Middle East, the media goes to not dissimilar lengths when it waits for Israel to respond to terror attacks before reporting, so as to be able to present a more "balanced" report of two sides clashing. Writing about the riots at the time at The New York Times, AM Rosenthal described how the media “treats it all as some kind of cultural clash between a poverty-ridden people fed up with life and a powerful, prosperous and unfortunately peculiar bunch of stuck-up neighbors" -- not unlike the way the Gazans are described vis-a-vis Israel. Rosenthal went on to describe those riots as an "Antisemitic pogrom" -- a term that certainly fits the behavior and goals of the current Gazan riots. One of the benefits of social media is the ease with which public opinion may be gauged. Today, readers not only read the story, but they can also affect which ones are covered just by clicking on them online. The gap between editorial decisions and the public is narrowed, emphasizing the importance of the democratization of the media. One benefit is the speed with which the public can lodge a complaint about a story. In 2015, The New York Times ran a story about Lawmakers Against the Iran Nuclear Deal, which included a chart that was supposed to do more than just show which Congressmen were in favor or opposed to the deal. The chart went so far as to show which Congressmen were Jewish -- and highlighted them in yellow. On the flip side, however, there is a negative aspect to opening up to popular input. Last year, Ira Stoll wrote ‘Parasitic Thug’ Is New York Times’ New Name for Netanyahu, about how The New York Times not only published an Antisemitic reader's comment describing Netanyahu as a "parasitic thug" influencing US elections, it also accused Jews of forming a "5th column." The New York Times even awarded the comment with a gold ribbon as a New York Times pick. The fact that the comment received 76 "thumbs up" votes from fellow readers is also food for thought. The comment was later removed. The fact that newspapers now have a trending chart, whether visible to the journalists (CNN) or just the editors (New York Times) is a further indication of influence readers can potentially have on newspapers. Towards the end of the discussion, Laurel Leff addressed the issue of The New York Times coverage of Israel. She insisted that no one covers Israel like the New York Times -- not even The Wall Street Journal because the paper itself has a different purpose. A better comparison would be between The New York Times and The Washington Post. Leff continued that it was not fair to say that The New York Times does not understand the Israeli perspective. Most of the journalists live there, some for a long time. By the same token, she claimed that Palestinians criticize journalists that they don't understand what is going on because they live in Tel Aviv and Jerusalem instead of in Ramallah. If only journalistic insight were a question of geography. She also noted that journalists get pressure from both sides as well as from both the left and the right and that journalists tend to side with whom they perceive as being the underdog. Taking Ari Goldman's earlier point about the errors made by The New York Times against Israel being honest mistakes, Dovid Efune asked Ira Stoll if he could think of any honest mistakes made by The New York Times that actually favored Israel. Stoll's example was a point he has written about before. There appears to be a tendency in The New York Times to refer to Mahmoud Abbas as "aging." Apparently, the point is that the paper feels that Abbas is senile, incompetent and unable to do his job, yet resorts to euphemisms instead of addressing the issue in an article. That hardly qualifies as "an honest mistake" made in Israel's favor. Too bad the question was not asked of Ari Goldman. The bottom line is that during the discussion, every effort was made, not just for balance, but to avoid piling on The New York Times. Despite the fact that Ira Stoll clearly had multiple examples of potential bias, based on the paper's use of double standards and anonymous sources and on the stories it ignores, those examples were mentioned only in passing with no actual examples given. Having raised the point that a claim of bias would have to show a pattern, Stoll could easily have presented a case -- a strong case -- which is why he makes numerous references to the "bias" of The New York Times in his book. Laurel Leff was deliberate in distancing the Sulzberger's of today from the original Sulzberger and defended the paper from any charge of bias. Her position seemed to be that The New York Times was no different from any other paper in its coverage of Israel -- only better. Ari Goldman felt the greatest responsibility for defending the paper. At one point, he went so far as to tell the audience that if they felt there was a problem with The New York Times coverage of Israel, they should tell their children to be journalists. But it was Ari Goldman himself who opened the door to the issue of New York Times bias in the Crown Heights Riots. Even given the restraint in the criticisms of The New York Times that night, it is hard to claim that was a unique case.